For a few short years in the second decade of the twentieth century, a group of artists in Russia created a new art form: books meant to be read, looked at, and listened to. 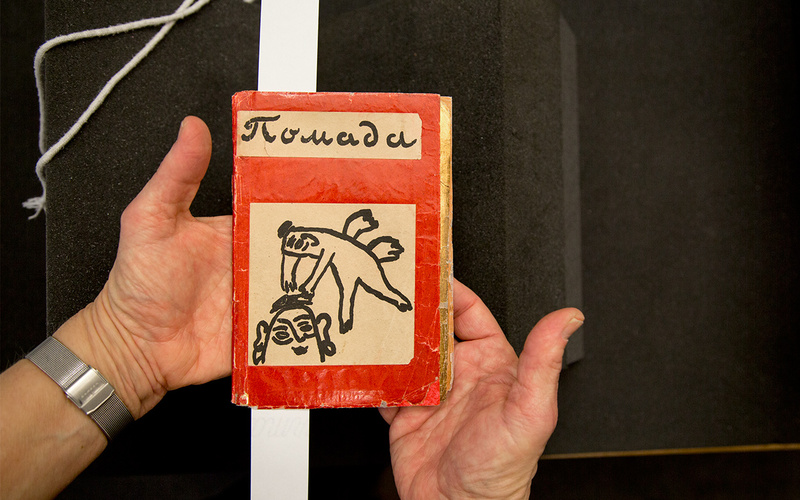 Artists had long made books as art, but these were different—handmade, hand-sized, serial, interactive. 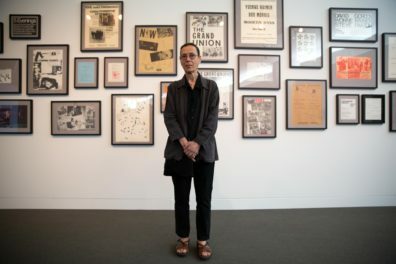 Combining sound poetry with lithography and rubber stamping, the books were collaborative in their making and in their relationship with the reader. 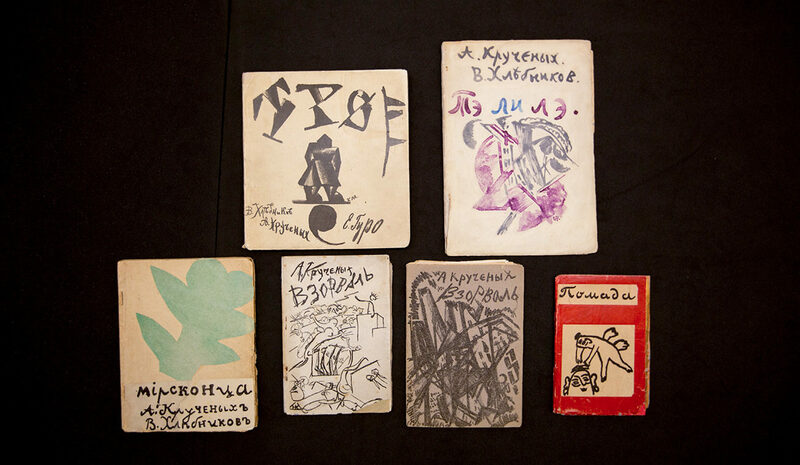 Russian Futurist books are small, some no larger than postcards. Their paper and design are deliberately coarse; each page of the book differs slightly in size and is bound with ordinary staples. The books incorporate found papers, such as wallpaper and imitation gold leaf, and feature collages and childlike stamping. Titles exist in small editions of 50 to over 200, and often involve subtle variations from book to book. Art historian Nancy Perloff, curator of modern and contemporary collections at the Getty Research Institute, has spent the last 15 years studying the Russian avant-garde, and her recent book Explodity: Sound, Image, and Word in Russian Futurist Book Art is the first work of scholarship to offer a close reading of these books as “verbivocovisual” objects, whose meaning derives from the interplay of image, text, and sound. 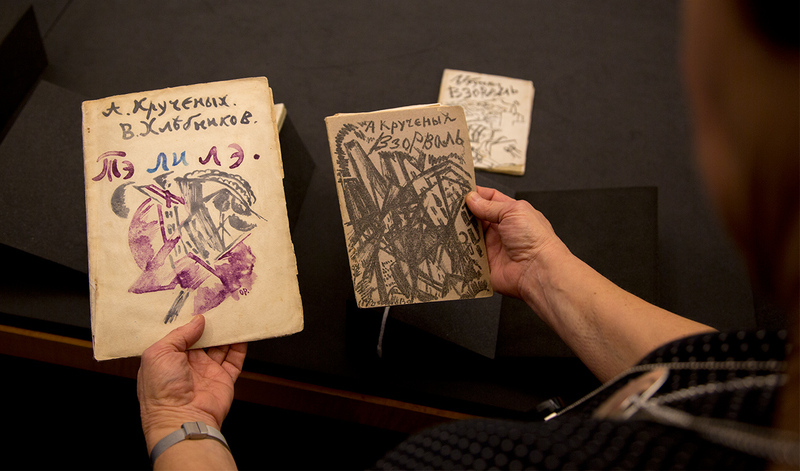 She bases her study on the remarkable collection of Russian modernist books held in the library of the Getty Research Institute. An online companion to her publication features full-screen reproductions of pages from the Getty’s Futurist books and invites you to listen to the poems and watch how they come alive on the page. Reading zaum books is a participatory experience: some pages require you to rotate the book to read the text; others invite multiple readings of the letters depending on whether your eye follows them across or down. The same poem can also reappear in different books, taking on a different character with a new page layout, script, and images and inviting the reader to interpret it anew. 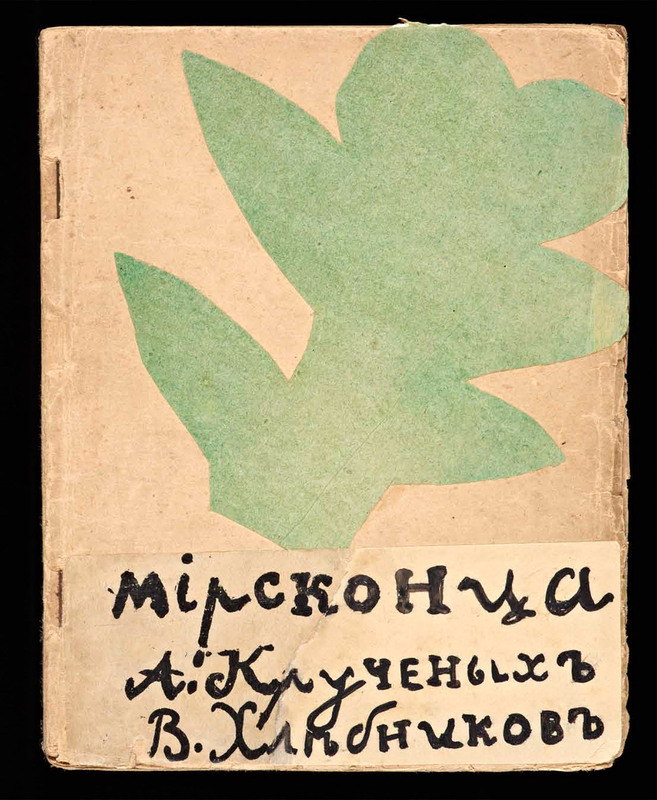 A collaboration among painters Natalia Goncharova and Mikhail Larionov and poets Alexei Kruchenykh and Velimir Khlebnikov, Mirkontsa was published in an edition of 220 copies. Every cover is different, and sometimes a poem is in a different place from book to book, or not included at all. 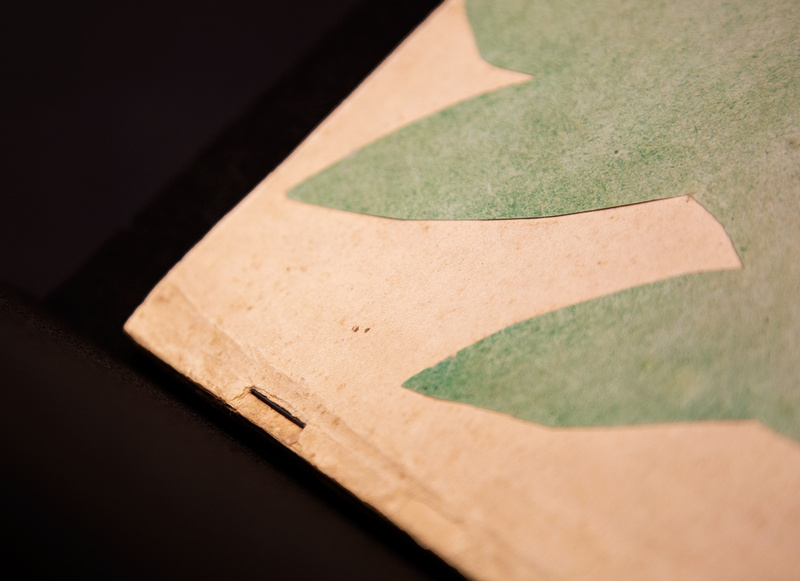 On the Getty’s copy, Goncharova pasted a green paper cutout in the shape of a flower that she deliberately extended beyond the book’s edge. Copies at the Museum of Modern Art, by contrast, have black and marbleized papers evoking a flower and an abstracted human figure. “She was playing with what happens when the shape differs, when the material differs,” Nancy explains. 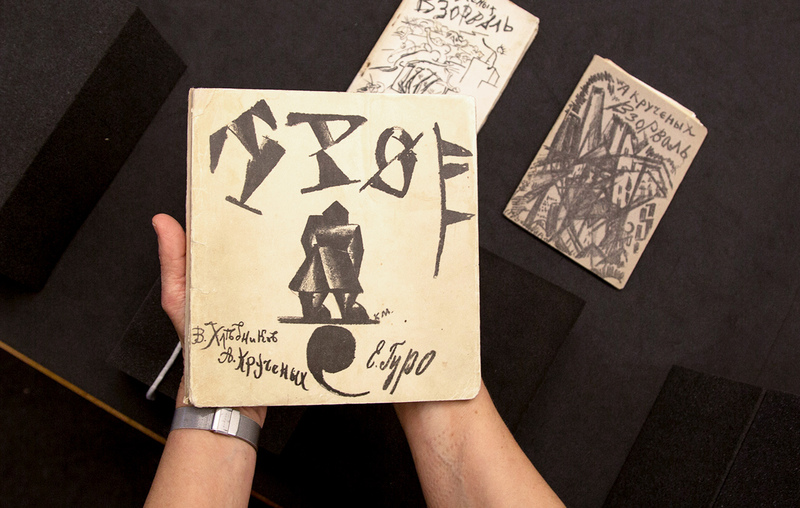 Throughout their pages, Russian Futurist books juxtapose words, shapes, colors, and images in unexpected and often puzzling ways. On the cover of the book Te li le, for example, Olga Rozanova pairs an apocalyptic scene of chimneys, smoke, and collapsing skyscrapers with a lyrical, flowing title in redemptive purple and blue. And what should we make of a full-page lithograph in the book Vzorval’ (Explodity) by Kazimir Malevich, labeled “Death of a man simultaneously in an airplane and on the railroad”? In this highly abstracted image, we can just pick out the wings of an airplane, and possibly the wheels and the tracks of a train—but where is the man? What is the meaning of his death? And how does this image function in the context of Vzorval’, a book that references guns, bombs, and suicide? Women played a role equal to that of men in Russian Futurism and “made crucial contributions to the books.” Natalia Goncharova and Olga Rozanova were the two leading female artists of the Futurist book form. 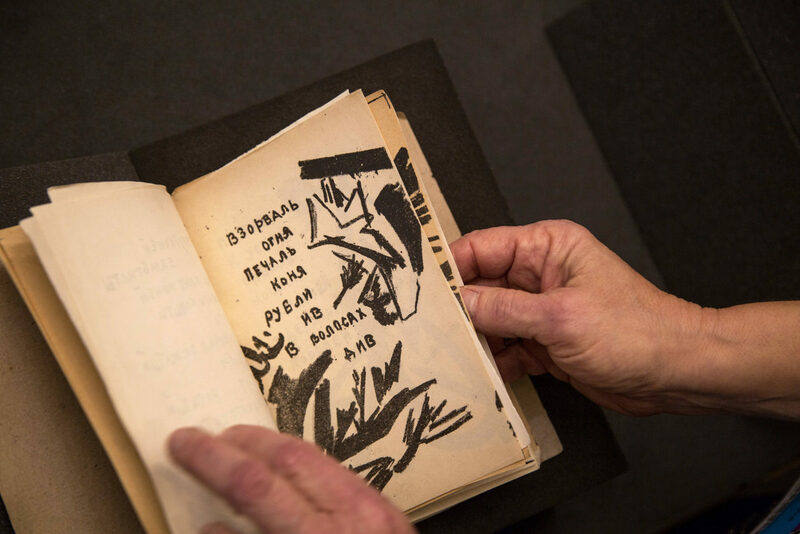 Despite the radical innovations of Futurist book art, it was marginalized in the West until the early twenty-first century, when the Museum of Modern Art in New York organized a large exhibition of Russian avant-garde books. Historical and personal factors are partly to blame for the neglect: World War I, followed by decades-long Soviet repression beginning in the late 1920s, ensured that these books were little known outside the USSR. Personal factors contributed, too: Khlebnikov died of typhus at 36, Kruchenykh quit writing, and others in their circle emigrated or took up new careers. 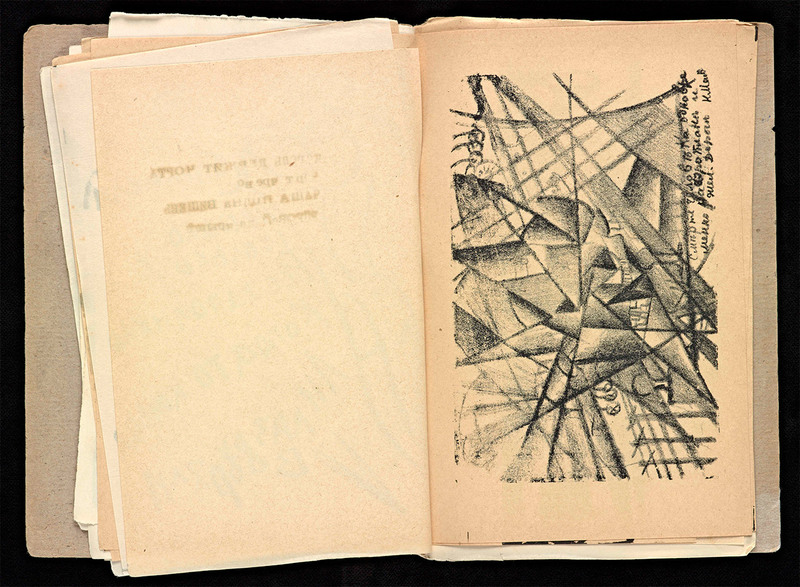 Yet, through pathways that are still not entirely clear, the Russian Futurist books survived to influence later generations of poets and artists, including the postwar concrete poets, whose work is on display in the current GRI exhibition, Concrete Poetry: Words and Sounds in Graphic Space. And their spirit lives on today in radical zine collectives. Art + Ideas podcast: Nancy Perloff on Russian Futurist Book Art, April 12, 2017. Explodity online companion, containing page-turning functionality, transliterations, and translations of 10 zaum poems. Nancy Perloff, “Mirskontsa (Worldbackwards): Collaborative Book Art and Transrational Sounds,” Getty Research Journal 5 (2013), 101–118. Nancy Perloff, Explodity: Sound, Image, and Word in Russian Futurist Book Art (Los Angeles: Getty Publications, 2016). Nancy Perloff and Brian M. Reed, ed., Situating El Lissitzky: Berlin, Vitebsk, Moscow (Los Angeles: Getty Publications, 2003).